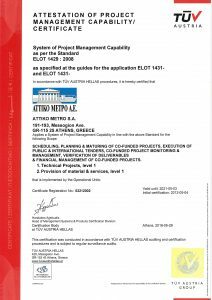 ATTIKO METRO S.A. ISO Certification – ΑΤΤΙΚΟ ΜΕΤΡΟ Α.Ε. 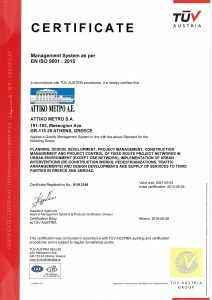 ATTIKO METRO S.A. was certified by the Certification Organization TUV AUSTRIA HELLAS on the implementation of the Management System according to the standard EN ISO 9001:2015. This certification confirms the high level of management efficiency of the company ATTIKO METRO S.A. in implementing its task and its goals. By granting this certificate, TUV AUSTRIA HELLAS recognized the effectiveness and management efficiency of the company “in the planning, design, development, organization, management, execution, supervision and control of the fixed route projects networks in an urban environment (OSE network excluded), the implementation of urban interventions and the preparation of designs and provision of related services to third parties both in Greece and abroad”. 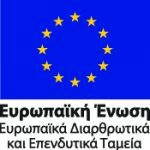 At the same time, by changing the company’s Terms of Association and by obtaining this certificate, a strategic goal of the company is achieved and its activities become more extrovert, permitting it to vigorously expand them not only within the boundaries of Greece but also internationally, in order to provide high level consulting services, generating thus revenue for itself.